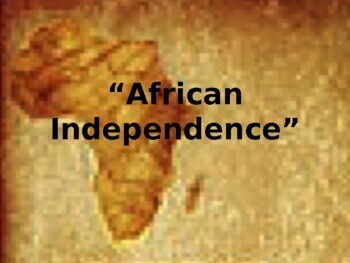 The following is a 17 slide PPT which identifies and describes the process of African Independence from European colonies in the 20th century. 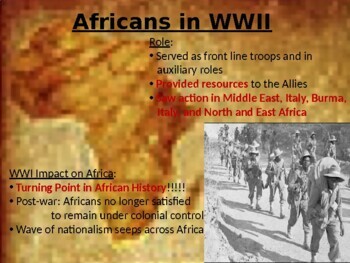 This PPT begins with slide on Africa's role in World War I and then a slide of Africa's role in World War II. 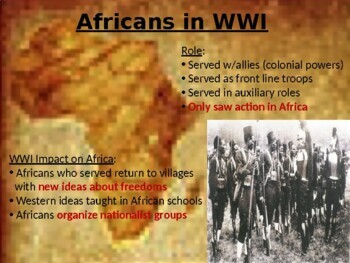 The PPT then transitions to describe African Nationalism and then covers each European nation one by one (from Great Britain, to France, to Belgium, to Portugal) and their colonies in Africa and the process in which they become independent and the effects and aftermath of independence on these newly formed African nations. 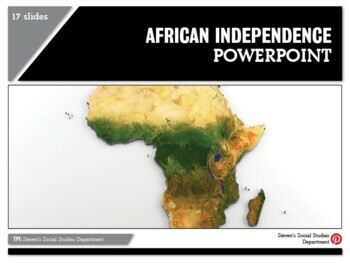 The PPT ends with a special 4 slide case study on South Africa and then a Compare and Contrast Questions for students to complete to assess their knowledge and understanding of Nationalism and Independence in Africa in the 20th century.